When a customer requests to have the same work done as a previous visit, you can quickly copy over the job information to create a new invoice without having to re-enter the line items, notes or customer info. Go to the job details page of the job you would like to copy. Tip: Go to the customer's profile via the customer database to quickly locate the correct job. Once there, click the wrench icon toward the top right of the screen. If the job has multiple segments created, you must select the segment you would like to copy into a new job. A window will appear to confirm the action. Click the 'copy' button in the bottom right to confirm. 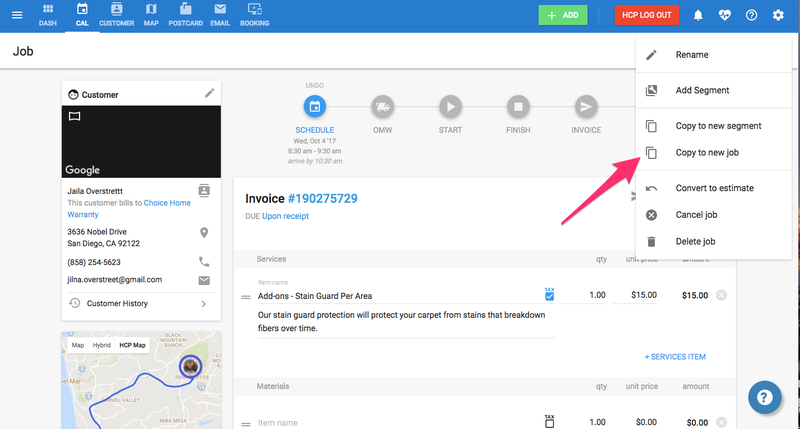 A new invoice will be created with the line items, notes, and customer information in tact. You can now schedule this invoice out for the appropriate date.